This week is a drill that works on play recognition and transition. Two D start at the dot and hash marks on one side, two F start at the dot and hash marks on the other side. 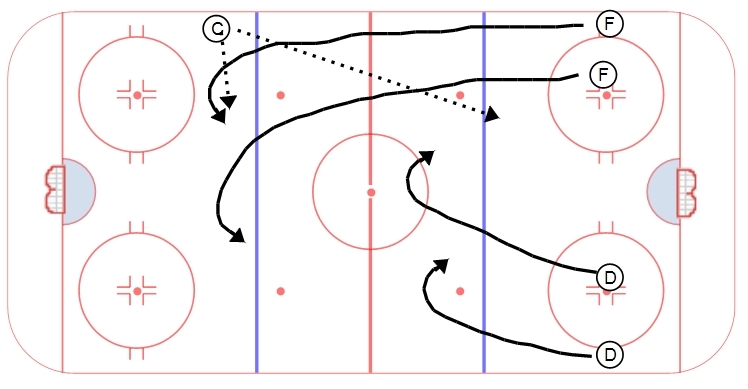 On the whistle, the forwards sprint towards the coach standing inside the far blue line while the D quickly gap up. The coach has the option to either give the puck to the F for a 2v2 rush, or give the puck to the D for a counter attack and 4v0 rush. D should focus on a tight gap and reading the play – if they counter they should surround the puck and quickly transition it to the forwards. If the play is a 2v2 rush, they need to have good sticks, efficient feet and good gap control. Forwards need to focus on quickly getting up ice and then creating rush options. If it is a 2v2: isolate a D and create a 2v1, net drive to create space, cross and drop with a pick, etc. If it is a 4v0: net drive shot far pad, net drive D fills lane, etc. I modified this drill by putting 4 D on the ice. So 2 D and 2F skate towards 2 other D. The puck is given to the F or the D. If to the D it is a quick rtransition 2 on 2. If to the F they do a 2 on 2. Works great as I don’t like the 4 on 0.